Non-alcoholic Beer Market size is estimated to exceed USD 25 billion by 2024; according to a new research report by Global Market Insights, Inc.
Changing consumption patterns, lifestyle and health awareness are major factors propelling non-alcoholic beer demand. Manufacturers have been keeping a watch on consumer trends on most likely beverages, leading to new product launches to match this popular trend. 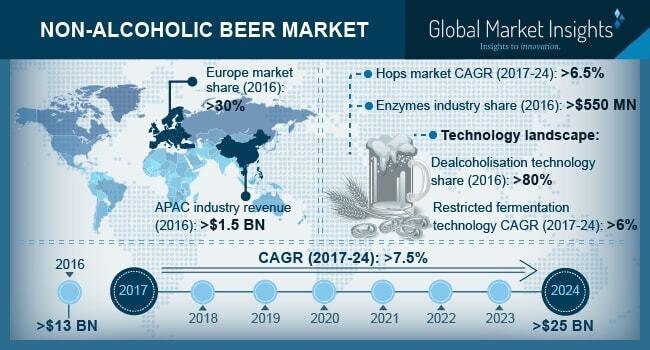 Growing acceptance of non-alcoholic or low alcohol beer globally among the majority of health-conscious consumer is anticipated to witness market penetration during a forecast time frame. Increasing product preference owing to presence of optimum quantity contents such as limited calorie and sodium will propel market growth. The product also has few positive health benefits due to the presence of good nutrient including B-complex vitamins, carbohydrates, proteins, fiber, protein, minerals, and antioxidants. Middle Eastern countries are expected to witness significant growth owing to their social obligations pertaining to the restriction on alcohol. The maximum allowed content in non-alcoholic beer is less than 0.1% v/v. Islamic countries have become a new attraction with large market opportunities for manufacturers to set up production units and increase product sale. The European non-alcoholic beer market has gained attention, factors such as alternative of liquor in celebration among sportspersons and teams during matches and tournaments has instigated demand. Also, for athletes it is important to recover fluid contains carbohydrate and sodium to rehydrate which will also enhance product penetration. Breweries and manufacturers are facing major challenges in production process owing to complex production procedure. Moreover, feedback from consumers regarding non-appealing taste coupled with presence of bitterness will remain a major threat to the industry growth. Lack of product labelling standardization owing to a different definition of non-alcoholic beer in various countries may result into loosing consumer trust. For instance, German made 0.5% ABV beer is an alcohol free, but in the UK made is considered as “low alcohol”. Malted grains dominated the material segment and accounted for over 70% of the industry share in 2016. Barley and cereals are widely used grains in traditional procedures to provide natural aroma and taste to the beverage. Hops generated over USD 1 billion revenue in 2016 owing to its natural flavor and bitterness required in the production. The rising popularity of the variety of flavors in beverage product ranges will propel growth in this segment. Moreover, additional advantages, including natural preservation, reduce excess proteins and generate foam head of the beer will stimulate demand. Asia Pacific alcohol free beer market accounted for over 18% of the industry share in 2016. Rapid urbanization and the emergence of the middle-class population are the major factors fueling regional industry growth. China, India, Japan, and Australia are the prominent market owing to the rising consumer income trend is supporting non-alcoholic beverages market growth. Europe market is anticipated to witness growth over 6.5% up to 2024. Growing popularity among athletes and sportsperson owing to its health benefits will foster market demand during forecast time. In European countries maximum allowed alcohol content in non-alcoholic beer is less than 0.5% v/v. This region is expected to witness high industry growth owing to the strong presence of breweries and manufacturers. Global low alcohol beer market share is partly consolidated and competitive in nature owing to the large presence manufacturers and breweries. Carlsberg, Heineken N.V, Arpanoosh, Behnoush Iran, Coors Brewing Company, Drop Brewing Co, Bernard Brewery, Suntory, Erdinger Weibbrau, and Kirin are key industry players. Other companies include Moscow Brewing Company, Krombacher Brauerei, and Anheuser-Busch InBev SA. Increasing competition and emergence of new entrants are expected to encourage new product development.